CNC Syntax Editor is a popular tool for writing, editing, and studying CNC programs with G codes. It has a comfortable and intuitive interface both for beginners and advanced programmers. CNC Syntax Editor is deceptively simple, but really powerful. What problems can be solved with CNC Syntax Editor? You can probably name several all-inclusive CNC editor tools, while it is really a problem to find good CNC editor software. CNC Syntax Editor is a feature-packed G code editor, allowing highlight a program syntax. It has a comfortable and intuitive interface both for beginners and advanced programmers. It visually splits commads and coordinates into tabbed groups. CNC Syntax Editor will help CNC programmers, CNC machinists, CNC operators, manufacturing engineers, process engineers etc with manual CNC code entry and NC file modifications. CNC Syntax Editor is a popular tool for writing, editing, and studying CNC programs (NC machine language) with G codes. It has a comfortable and intuitive interface both for beginners and advanced programmers. CNC Syntax Editor is deceptively simple, but really powerful. Getting started is easy. CNC Syntax Editor is ready! After installing CNC Syntax Editor, start it from the "Start->Programs" group. Select the "File->Open" menu item if you want to edit existing CNC program or select select "File->New" if you want to create new NC program. Now you can simpy type you G code in the editor window. Exchange axes. This function allows the user to exchange the values of one coordinate address to another. 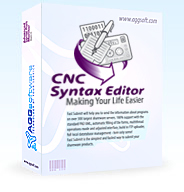 CNC Syntax Editor supplies a two cut down versions called CNC Syntax Editor Free Edition and CNC Syntax Editor Professional. Free version omits some of the advanced features found in the professional edition and is ideal for users who either want a low cost or free solution or are not interested in more advanced features. Read more here.